The "Solitude" is our first floor, Beachfront Bungalow, Three Bedroom, One Bath, plus private outdoor shower, nestled in a tranquil, natural setting, directly Beachfront on the Number one beach in the USA Siesta Beach!!!! Included with your stay: Complimentary Bicycles, Beach chairs, Beach-Towels, Free-rides around Siesta and a 7-day week office for your convenience and guest needs. Queen in master, Queen in the second room and two twins in the third bedroom, plus a Queen sofa bed in living room. Spectacular views of the famous Siesta Beach Sunsets. There is a large deck and backyard with grill and picnic areas for cookouts, and a great space for children and pets too! Easy private access to the beach. 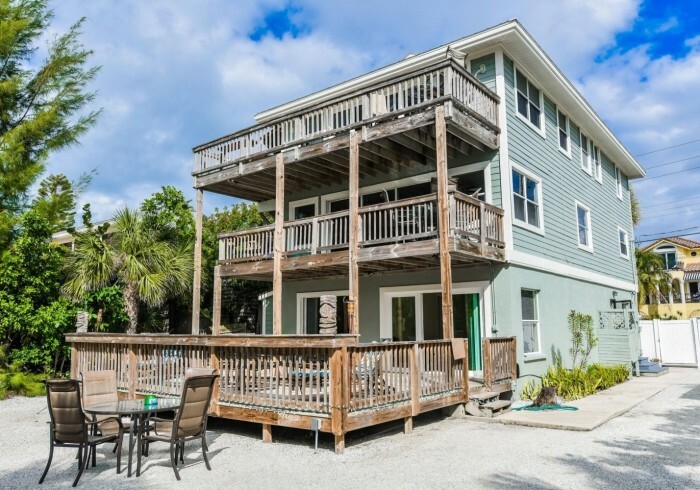 Five-minute walking distance to the public beach and Siesta Key Village. Close to amenities, but far enough for privacy.